Preserving eggs in the refrigerator for 9 months is unfathomable to most people, let alone safely preserving eggs that long without refrigeration. But today I’ll make crystal clear how you can preserve eggs worry-free without compromising your health and taste standards and perhaps I’ll even shed some light on how you came to believe that eggs can only be preserved in a refrigerator. I assure you that Kellene has not lost her mind; I’m not some maniacal bad guy accompanied by the theme music from Jaws as I write this. Just read further and you’ll understand that this Preparedness Pro is no fraud but some other trusted entities may have been feeding you a fish story for the past several decades. Bottom line, if you look at how nature preserves eggs you can learn an awful lot about preserving your own regardless of whether your purchased them at your local superstore or you collected them yourself from your personal brood of hens. 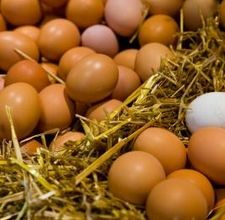 When a chicken lays an egg, it has a natural coating on it known as the bloom. This bloom is a layer of protection for the egg which keeps out oxygen as well as harmful bacteria and germs. It’s very, very common for those who raise chickens for their eggs to collect them and then keep them on the counter until they are ready to use—not put them in the refrigerator. And in fact, the majority of the grocery stores in the world don’t put their eggs in a refrigerated environment. When they’re ready to use the eggs, they either wash them, which eliminates the bloom and any bacteria or germs, or they crack them open—just as is—but take care not to do so over food that they are going to eat. Instead, they crack them into a separate dish or into a clean hand, but never over the food that they are mixing them. Also, in order to not spread the outside germs into the eggs, they never separate them with the egg shells; instead, they use their hands to separate the yolks from the whites. While it’s absolutely normal for you and I to get our eggs from the refrigerated department of the grocery stores, it’s actually very unusual in the rest of the world; eggs, butter, and most cheese products are usually just sitting on the shelf, not in a refrigerated display. Mind you, that doesn’t mean that the U.S. is wrong in such practice, but it’s important to remember that the majority of steps taken by the food industry are to avoid a lawsuit or to comply with whatever figments of grandeur the USDA wields as it creates various requirements. Such policies are not necessary to practice in your own home. Keeping that in mind, there are several steps you can take so that you can take advantage of great sales on eggs and not have to worry about whether or not they will all fit in the refrigerator. Yes, you can preserve your eggs long-term without worrying about your family getting sick. There are several methods you can use and I’ve written of a couple of ways previously, but my favorite one (because it’s the easiest) is using mineral oil. All you have to do is warm a quarter cup of mineral oil (just about 10 seconds in the microwave will do). Set your eggs outside of the carton (because it will be hard to get them out one you start using the mineral oil). Put on some food handling gloves (I buy this at one of the warehouses). They are easy to use for safe food handling but they are also a lot less expensive than medical gloves and yet in some circumstances they can be used instead of medical gloves. They are NOT puncture resistant though, so exercise caution if using them for that purpose). Dab a little bit of the warmed mineral oil on your hands and then pick up an egg. Run your oiled hands all over the eggs, making sure to cover it completely with the mineral oil. Don’t worry if you’re putting it on too thick or thin, just so long as every part of it is covered. When you’re finished with an egg, put it in the egg carton, small pointed side down. 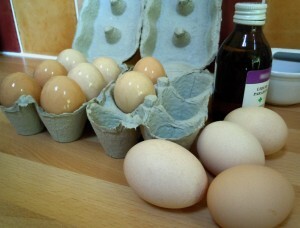 A quarter cup of mineral oil should easily do 4 to 6 dozen eggs. Now, store your egg cartons in a cool, dry place. You want the temperature to be about 68 degrees for long-term storage—otherwise storing them like this in your regular room temperature is just fine for a few weeks. Remember, the eggs come out of a warm hen. I’m always asked if this will help the eggs keep longer in the refrigerator too. The answer is yes. You’ll want to set a reminder on your calendar or cell phone to flip your eggs once a month at which time you’ll simply flip the carton upside down gently so as not to break any of the eggs. Do this every month to maintain the integrity of the egg yolk. Don’t worry about an egg going bad and you not knowing it. Believe me; in this case theNOSE KNOWS. Rotten eggs smell awful. They won’t be able to sneak up on you. 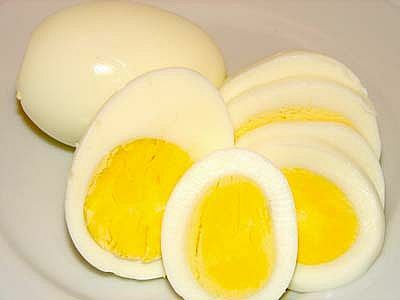 The gas hydrogen sulfide develops as bacteria breaks down the proteins in the egg white, creating that nasty gas smell. There’s another way to tell if your egg has gone bad. As oxygen gets into the egg, it creates an air bubble inside in place of moisture and carbon dioxide. This will cause the egg to float when placed in cold water (at least double the depth as the length of the egg). Anything other than a floating egg is fine to ingest. Don’t be put off by the other things that you might see in your egg. Some things may look odd to you, but don't worry, there is nothing wrong with your egg when you see the little red spots in the yolk. Those spots (usually referred to as meat spots) just mean that a blood vessel ruptured during the formation of the egg. They are diluted as the egg gets older, which means that if you actually see them, your eggs are still quite fresh. Another misinterpreted egg issue is when you see a white strand (chalazae) in the egg white, usually right next to the yolk. It reminds me of a white umbilical cord. They are only there to keep the egg yolk centered and are sometimes more obvious in some eggs than others. Even if you see an egg white that is cloudy or has a yellow or green hue to it, it doesn’t mean that it’s bad. In fact, quite the opposite because it indicates that the carbon dioxide just hasn’t had enough time to escape the egg. Even if you end up with a fertilized egg, it’s still safe to eat. Of course all of these instructions for egg preservation only apply to eggs which you intend to cook prior to consuming. The nice thing about preserving eggs this way is that your deviled eggs will turn out better. The shells peel off of old hard-boiled eggs easier than fresh ones. In fact, the only downside I have found to preserving eggs this way is that they are pretty much useless when you want to whip up some egg whites. Old egg whites are very difficult to whip into a stiff stage once they’re older than a couple of weeks. Yes, you can do this method on grocery store eggs. The grocery store egg distributors make sure to wash off the bloom and then refrigerate them. Your mineral oil essentially reapplies the bloom. Of course I always look at the dates on the egg cartons and get them as “new” as possible. This preserving eggs method will allow your eggs to stay good for 9 months and sometimes as much as 12. 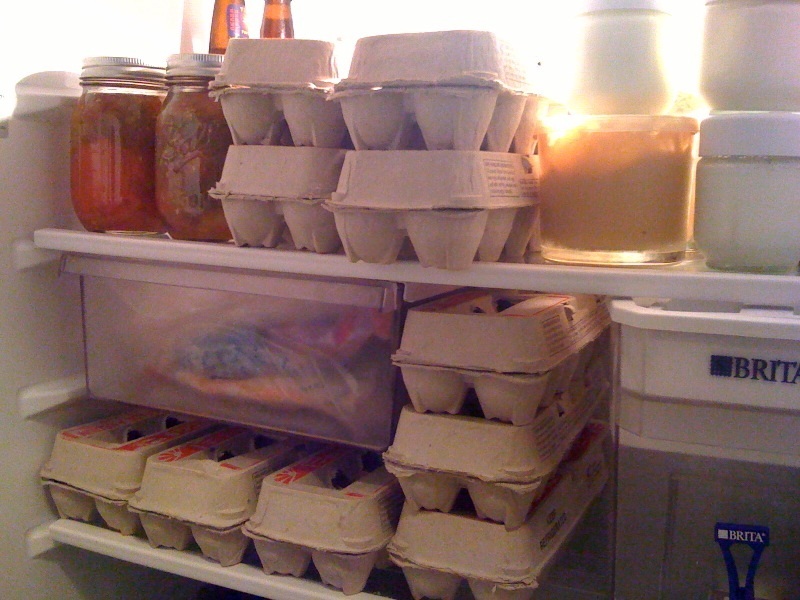 Obviously, rotating through your eggs is standard, so I like to number or alphabetize my eggs so that I can keep the egg cartons together in the batches that I purchased them. That way if there ever is a problem with a group of eggs, I know where they came from and can look at all of the eggs that I bought in that particular batch. You could also simply use a color marker coding system and get the same result so long as you stick with a particular color cycle. One last thing to mention here; the mineral oil. Mineral oil is found in the pharmaceutical sections along with Pepto Bismal, laxatives, etc. as it’s commonly used to help with bowels issues. However, I only use it for this purpose and with gloves on because it is a petroleum product. Petroleum products do cause estrogen dominance in a woman’s body which then causes a host of other problems in the body. So please don’t use it topically. This also goes for baby oil which is nearly 100% mineral oil except for the addition of a fragrance; though this means that you could also use baby oil in lieu of mineral oil. Now that you know that preserving eggs is easy, you can use your egg substitutes to bake with and you’ll still have plenty of great eggs for those times when you just gotta have an egg over easy, deviled eggs, poached eggs on toast, homemade mayonnaise or a delectable hollandaise sauce! A good hollandaise sauce makes the little bit of time I have to spend preserving eggs all worth it! HOT TIP: By the way, Walgreens has eggs on sale for only 99 cents a dozen, limit 3 per person. So I'm purchasing 3 dozen every day this week at two different Walgreens then slathering them all up in mineral oil. Now that you know all about preserving eggs, you can use this strategy too! AND you can take the Walgreens advertisement over to Walmart and Target and buy 3 dozen eggs from them TOO at the same price! Work it! *grin* Be sure the check out the other articles provided on this topic. Enjoy! Mineral oil absorption/ingestion has recently been linked to an increase in several forms of cancer, tumor growth, lymphoma, and leukemia even though it is prevalent in moisturizers, sunscreens, baby oil products, etc. Using coconut or another food grade oil might be a viable alternative as you are recreating the vapor barrier that the "bloom" creates naturally. Definitely a plus for egg keeping. Good post. kdonat unfortunately other food grade oils will go rancid--even my beloved coconut oil if exposed to oxygen for too long. Janetw and Kdonat below 68 is just fine for storing the eggs, but I wouldn't store any dry goods in there with it being damp like that. @Preparedness Pro - Kellene Bishop @kdonat Nothing goes into storage without being vacuum sealed and then packed into food grade 5 gallon buckets. I have an old house and sometimes a mouse finds its way through the crawl space and into the basement room. By the way if you're looking for GOOD food grade buckets, I get mine for FREE from the lady that decorates cakes in the deli at my local grocery store. Their icing comes in these teriffic buckets sealable with a rubber o-ring in the lid. Since she's so willing to help me out, I make sure she gets a bottle of fresh maple syrup that my husband and I cook off from the trees in our woods. We have 20 buckets hanging this year and right now I am cooking off a batch on the wood burning cook stove. There's something to be said for living in the middle of nowhere. @janetw Good grief!!! What''s next, house to house searches and hauling me off to a FEMA camp because I have too many green beans? Janetw and Kdonat there's a very small mark up between wholesale and retail on the mason jars. But if you're going to order $200-$500 worth, it may be worth your while to hook up with a wholesale distributor. @Preparedness Pro - Kellene Bishop @kdonat Where I live there is a weekly paper that is nothing but ads from private citizens. Nearly every week I see ads for canning jars for sale. You might check to see if you have a similar paper. If you don't see jars for sale, maybe there is a section for placing a "looking for" or "want to buy" ad. Also try garage sales or Good Will type stores. Estate sales in farming areas are good too.. Sometimes the family farm is being cleared out when no one wants Grandma's kitchen stuff. Usually lots of jars there. Maybe Craig's list? janetw and kdonat Also Free Cycle--I cover this in the recent thrift store article. I love those frosting buckets. Thank you. I have Duck and chicken egg to preserve. Thank you for helping me. @Preparedness Pro - Kellene Bishop @kdonat What about using Oliver oil? Geneva Garrett and kdonat I don't know Oliver personally, but I do know his cousin Olive Oil. :-) For many years in Europe they would wash the eggs and then keep them IN their vats of olive oil. However, even olive oil can get rancid in just a few months time depending on what quality you purchase to begin with. It's a synthetic petroleum product just like mineral oil. So could you use coconut oil so long as you used them before the oil goes rancid? I live alone and I'm just really tired of throwing out eggs that I don't use fast enough. I wouldn't think it would go through the shell and contaminate the egg, though, would it? Anyway, good general comment on mineral oil, though. I threw out al my mineral oil products years ago simply because my 6th sense told me that if it was a petroleum product, it can't be good for your body. I have been using bees wax products from a local beekeeper for my lotions. Suzie Queue Nope, if it's keeping oxygen out, it's definitely not letting the mineral oil get through either. There is an expensive kind of wax that you can buy specifically to do this. But I can't find the name of it anywhere when I search the internet. But I know I've seen it. Could it be cheese wax? It comes in red, black, and yellow blocks and it doesn't crack when u brush it on cheese. I wouldn't go that route though, too expensive. Suzie Queue Ke-Peg is what's called. It cost's about $25 for one jar but claims it will do about 40 dozen eggs. It's all natural and doesn't contain any chemicals. what is ur answer for the risk that raised by kdonat ? does really it has risk for cancer ? Mineral oil is indeed a petroleum product which makes it an estrogen mimicker which is found to cause cancer. The key is to use food grade mineral oil, but even that's being allowed to be less than fabulous by the USDA, so if that's a genuine concern I'd definitely go with jojoba oil instead. Would a combination of Ke-Peg and mineral oil work? It would reduce the risk factor associated with petroleum and would reduce the price of purchasing expensive jars of Ke-Peg. Mineral oil IS a petroleum product. You don't need both. The KePeg will do a whole lot of eggs--40 dozen as per their website. I started doing this and it works great. The longest time I "stored" eggs was 6 months with store bought eggs before they were rotated out and used. I'm doing a test of fresh eggs straight from the chicken, but I just covered with mineral oil and did not wash them before storing. I'm hoping the "Farm Fresh egg yolks hold up better than the store bought eggs. If you have a Cash and Carry store they have 15 dozen eggs for $12.96. Jamie l thanks for the heads up on the sale! Great idea of use of the mineral oil. I have been using my vacuum sealer packing up 2 doz per bag. You have to put the cartons' bottoms together, then stop the vacuum just before it starts to crush the carton. Keeps out the oxygen and keeps the eggs fresh (unknown period of months). I have never had any of them go bad and I buy 10 doz at a time (at Kroger stores when on sale 10 for $10). I may have to experiment with this idea, Suzie. Considering how much I love my FoodSaver and use it for other purposes, you'd think I would have tried something like that by now. :-) Just one more reason why I love rubbing elbows with like-minded people. Suzie when you use your vacuum sealer, do you have to use any kind of oil on them? Also when using them how/where do you store them? I don't know if it was Mark Twain or HL Menkin that said "It's not what we know but so much that we know is untrue". 16 oz of mineral oil is very cheap and a multi tasker, a dozen eggs can be had for less than a dollar, so for less than $5.00 you can test it out in a fridge or a cool dark place. When you see it works you can buy up the eggs and do French Toast, knowing you have plenty of eggs as back up. What a great protien that can be stored so easily and last so long with minimal effort. Well I didn't mention fritatas or quiche so I thought I was restrained ;) Oops oh darn again. I've always told people that eggs were the perfect food. When everyone was (and still is) on the low fat diets (that now are acknowledged are harmful for you - the new diet is the Mediterranean diet - I agree with that) I ate my eggs and bacon every day for breakfast and never gained weight (you have to cut out the toast and potatoes). And at 64, my skin is still smooth and tight. (I've been told I look like 40). I have alot of cheese wax I have haravested from cheese wheels used at our restaurant , I would think that this would also be ok to use ? or maybe even parafin wax? You can use Baby Oil? I've got a bottle stuck in the back of my linen closet from when my teens were babies. Think I could use that? There's a better Way! DON'T EAT DIARY PRODUCTS! If u know anything about healthy eating ..... humans should NOT EAT DIARY PRODUCTS! This is the SCAM of the Diary industry to sell there CRAP!!!! Good thing, eggs are from a CHICKEN not a COW...no dairy involved.. O.o. Eggs are typically considered a dairy product (though it's a misconception that even I have fallen into;sold in the dairy section, etc. but they aren't actually dairy. They are an animal by-product, just to clarify, Sarah. Contrary to a somewhat common misconception, eggs are not considered a dairy product, which refers to the product of the mammary glands of mammals such as cows, goats, sheep and others, and the products derived thereof. The misconception that eggs are dairy products is often a result of a confusion between the terms dairy product and animal byproduct. While eggs are, indeed, produced by animals and, therefore, an animal byproduct, they are not a dairy product or a derivative of dairy products. Although many persons who do not consume dairy products also do not consume eggs as a result of allergies, dietary restrictions, ethical beliefs or other reasons, persons who have milk allergies or are lactose intolerant but do not have an allergy to eggs are able to consume eggs as a part of their diet without the negative results associated with dairy intolerances or allergies. Another clarification, if you don't mind. The eggs come out of the chicken at body temp. They are then refrigerated by the 'industry'. It IS OKE to take them home, coat them and then NOT refrigerate them for long term? Just want to make sure that the multiple changes in temp during the prep process is safe. -Thanks! That's exactly what I've been doing all this time. I've only had 2 bad eggs. I think i will be stocking up on eggs now and mineral oil lol :) and trying this out so awesome! Thanks you are so good with this stuff. Kellene can you use the mineral oil on fertilized eggs? We have a rooster with our hens. Yes that also goes for Baby oil. There's a great book called the Estrogen Alternative that really sheds light on this serious problem. Estrogen dominance is responsible for infertility, hormone imbalance, ovarian cancer, endometriosis, and a host of other ailments according to the author, Dr. Judi Gerstung. Just because you win a round or two of Russian Roulette, doesn't mean you keep playing it. what about cheese wax or parafin? Mark C That's way too expensive and you can't recycle the cheese wax. Parafin cracks over time. Cheese wax and paraffin are also a petroleum products. I'm not sure what cheesewax you're purchasing, but there's no petroleum product in the cheesewax I get. And paraffin is a "no-no" when it comes to waxing cheese. The red cheese wax at cheesemaking.com says it is a blend of paraffin and microcrystalline wax. Both are petroleum base products. And who knows where the red dye comes from. I buy mine commercially, not from Cheesemaking.com but there are very few folks who want to purchase 50-100 pounds of cheesewax at a time. Great article. With fresh eggs should I put mineral oil on them as an added protection? Should I wash any chicken matter off before oiling? MichaelGoodell The farmer who taught me the mineral oil method only used the mineral oil on eggs that they weren't going to get to for a couple of weeks. He says that the natural bloom is the best coating but it begins to smell after a while so he'd wash them and then coat them. If I have laying hens and collect there eggs without washing them, should I still coat them with mineral oil? @G2Shooter I dry wipe the eggs to knock off any nasty stuff and coat in mineral oil and I get great results up to 6 months with eggs straight from the chicken. Sorry I always run out of eggs before I get past 6 months. Simply put "canning meat" in the search bar and you'll get step by step directions on canning along with pictures. Hi, found your site through the Prepper show on Nat Geo. I have a question re the egg storage. I live in AZ (hot) and it's about 67 - 70 here in winter (in my mobile home) and can get up to 85-90 in the summer as my utility bills are skyrocketing due to the bad insulation in my rental. Are these temps too extreme to safely store the eggs for the "up to 9-12" months. Could I store for 3-4 months and still be okay? I know they will smell if they are bad, but I don't want to spend the money on a ton of eggs if it really won't be a viable option. They are 88 cents a dozen this week - woo hoo. Thanks and you have a phenomenal site! FrancineBeyer Nope, that's way too warm. You need between 55 or 60 or cooler for the egg storage long term. If they are fresh, right out of the hen you'd be OK for a few weeks at that room temperature at most IMO, but store bought eggs--I wouldn't chance it. try digging a cellar. mother nature has her own cold storage in the earth. A cellar still has oxygen and an egg shell still has pores which is how eggs go bad over time. Thanks for the quick reply - I was afraid of that - if I move and have an unlimited supply of nearly free air conditioning - I will definitely do the egg thing! Your site is great - I am learning a lot. Thanks for your dedication!!! You might consider a make shift root celar I saw a utube video where a guy burried an old no. Worki g refrigarator and covered tbe door in straw he said it worked just like a root cellar to keep things at an even temp all year long. This could mabbye be done on a smaller scale with a large cooler with a good sealing lid.? lawanna Basically I double classify them (redundancy is a common trait for preppers). I label them all on the top as to the date when I treated them. But then I also look at the manufacture's date and then essentially SUBcategorize/date them . @lawanna My mom used to can meat. The one and only time she added water, it spoiled. The meat will make it's own juice as its prepared, so there's really no need to add water. YES, YES, YES you can add water. There are so many variables you don't know about your hypothesis there that I caution anyone who "solves for X without understanding Y and N"
If you are worried about mineral oil, how about using honey? it doesnt go rancid and it kills bacteria, as far as expense a little will go along way. AmyThompsonLedbetter I'd spend the money on the KePeg first or use salt storage or bran storage. I guess Im asking if Honey would work? Honey is a natural antibacterial. However, it is water soluble so humidity would play a factor in whether or not it continued to adhere to the egg. I would not risk it. Uh, nope, that's not quite correct. Bacteria can't thrive in honey as the sugar content is too high. There are no botulism spores in honey, however, rare instances of botulism can occur IN THE BODY after consuming honey. Let's be sure we only give factual information in our comments here. OK? Thanks. I think i saw you on nat geo last week. you showed how to preserve eggs with the same method. I was just curious, how long do they store for at 68 degrees doing everything that you said? JoeZerbe, 8 to as much as 12 months assuming that you store the items in proper storage conditions of COOL, DRY, and DARK environment. If you don't have a cool place like a basement. Yes, you need 72 degrees or lower for proper storage conditions. (68 degrees is preferred.) While you may not have a basement, utilizing space at the back of closets and under beds will be your best options. My family and I saw you on the Prepper show and was so excited about all the information and even more excited that you have this awesome blog. I'm looking forward to so many more possibilities to become more prepared. Thanks for all the wonderful information. I live close and would love to take a self defense class sometime. I have a big family and want to be as prepared for the future as possible. Thanks again for all the information. Lots2save, We are so excited you've found our blog!--and a fellow couponer at that! yay! Sometimes I get an egg that is stuck to the carton of eggs. Do you have a way of getting the egg out without breaking it? Just wondering. Great info! I will print this article to keep in my " Just in case..." folder. I will not be able store my eggs for very long here in South Texas it just is too hot most of the time. For our long term food storage I got several cans of egg powder from (edited for spam: Shelf reliance/Thrive) Each can has 236 eggs in it so just a few as a backup will be a blessing should you ever run out of eggs and have no way to buy any. I have used them in baking and they work great. These eggs also taste quite good in omeletts with some cheese and ham/spinach/mushrooms... all things you can also buy freeze dried from the same company. Highly recommended! So glad you found us, really! Aquaponics in my opinion is better that hydroponics. I just watched you for the first time tonight on the National Geographic Prepper show. I was in AWE over everything you and your Husband have done to prepare for any type of doomsday event. When the show ended, I immediately went to the national geographic website to see if I could find some information about how to make my own emergency plan, and I was so happy to find a link you your blog. I have always wanted to develop a plan for my own family, but never really know how to start, now, thanks to you, I can start preparing.. I hope you know what a saint you truly are for providing us with all of this great, life-saving information. So glad you found us here. :-) I'm glad that you got something out of the segment. If the absence of oxygen is the key to preservation, have you tried placing the cartons of eggs in a thick mylar bag, draw out most of the air ( before crushing the shells), then adding the proper size oxygen absorber? I'm looking forward to hearing/seeing the confidence that this project brings you in parting ways with the modus operandi of today's food storage culture. I'm really going to put in a big push this year to share more and more of these types of solutions. I'm trying several right now and am looking forward to writing about them as I process through them all. Girl !!! God Bless you for sharing and putting comfort and security into the lives of others who feel uneasy about our country's future.... including myself ! You have truly found your God given talent and purpose in life ! Question...if I am to preserve store bought eggs with the mineral oil...should I leave them out to room temp. before I rub the oil on them or can I rub the oil on them as soon as I get them home from the store still cold ? I hope some day my husband will think I am just as clever and wonderful as your husband thinks of you. I'm waitng for my husband to have that ah ha moment...right now he's just scratching his head at my storage room wondering if I've gone mad or what ? But every so often when he hears of someone he knows on face book thinking of doing the same...he sort of gets on board...and sort of not. All I can say is as long as he lets me do this there is no stopping me ! Keep up the great work and site ! 2nd-nope, no need to let them sit at room temperature. Is "food safe" mineral oil the same as pharmacutical mineral oil? Can either be used to coat the eggs? And when you coat them, does the oily look go away after awhile or should they stay oily? I glad to see you on NatGeo's preppers. I've been to a couple of your clases and love your info. I just want to take a moment to comment. Kellene, my wife and I just watched the episode on natgeo, you have showed us another idea (eggs) that we plan to use in our food storage. Would love to hear more of your ideas! Most impressive!!! Thank you! Glad you found something helpful. The search bar is your friend on this site. There are hundreds of original articles. Thanks again! Praying many blessings to you and your husband! Just a quick question...do you buy your cheese wax locally or on the web and...have you ever tried to vacuum seal cheese for the same result???? Cheese wax allows the cheese to still breathe which is why when I purchase it and bring it home I immediately take it out of the plastic wrapper and wrap it in a dry paper towel and then put it in the fridge ready to use if I don't wax it right away. I buy my cheesewax locally sometimes from Real Foods. Denise, First of all, Welcome to Preparedness Pro! I suggest that you do a search on "cheese waxing" on this site. There are a LOT of details there. But if you really want to get the nitty gritty, there is a resource guide with a DVD called "For the Love of Cheese" under the Prep Pro Classes tab. Interesting idea on the hard boiled eggs. The answer is yes, though you'll actually run a higher risk of the eggs going bad as they may get hairline cracks during the boiling stage. So you'll want to be extra, extra careful. I have a question...I thought I already posted this, but I don't see my post or the answer to it...so, will re-do it. I understand from a friend who has their own chickens that they freeze the eggs in the shell and they last for up to a year. Have you ever tried it and does it work as well as just preserving them your way? I've learned a lot from your posts and hope to implement them in our storage as well. I have never tried that method because it's relying on electricity. I'm trying to use as many methods as possible which don't rely on electricity. I want to store dry beans and rice and do not have a lot of money to buy fancy storage containers. Should I wash them the beans and be sure they are dry as many come dirty and I have water to wash them now but maybe not later. Can I use coke bottles. glass jars with plastic lids. to sore them What quality of plastic would be acceptable. Does water storage for drinking have to be glass. I had seen some on the internet that didn't seem to be dangerous. There's an article I wrote called "Where to Store all that Water", put that into the search bar. Your beans will be fine in the containers you suggest, however, I would recommend putting some DE in each container for bug control. Dry is better. If you wash them, you could cause them to sprout during storage. When going to sea, we would preserve eggs using "water glass". A quick dip. and store. Rotate Sodium silicate was also used as an egg preservation agent in the early 20th century with large success. 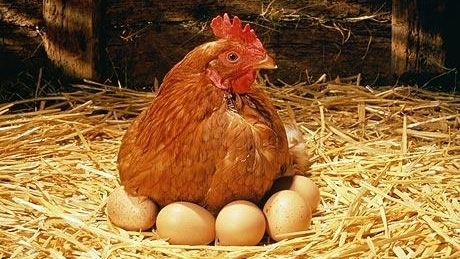 When fresh eggs are immersed in it, bacteria which cause the eggs to spoil are kept out and water is kept in. Eggs can be kept fresh using this method for up to nine months. When boiling eggs preserved this way, it is well advised to pin-prick the egg to allow steam to escape because the shell is no longer porousto preserve the yolk integrity. I have dehydrated goose eggs. I slowly scrambled them in a nonstick pan without any additives. Then I spread them out and dehydrated them for several hours until they were crunchy. I have noticed that when handling the dehydrated eggs that my fingers become very oily. I did two batches with same results. Does anyone know anything about this oily residue. I have vacuum sealed the semi powdered eggs in a jar but I am concerned about them becoming rancid because of the oiliness. After watching your episode, my family and I just started prepping. I was wondering if the eggs had to go down to room temp before applying the mineral oil on them? The ones I buy in the store are still cold by the time I get home. Also, once I am ready to use the eggs, do I have to wash the oil off first before cracking it open? Thanks so much!! Unless your pot luck dish of choice is deviled eggs, why try keeping them in a shell? Wouldn't it be more space friendly to dehydrate them? Do you have to let the eggs cool down to room temp before applying the mineral oil? Do you rinse them before eating? Also how long do they stay good if kept at room temp on a shelf? thanks a bunch! Rinsing them won't do you much good as it's an oil and oil and water don't get along well. You don't have to have them be a particular temperature, but you do want to make sure you warm the mineral oil before applying it. It goes on thinner and gets into the pores better. Curious on your thoughts of using Jojoba oil - it's more expensive than mineral oil, but not a petroleum product. In fact, it's not even an oil, but a plant wax, so rancidity won't be an issue. Is it just a matter of sealing the pores to keep the oxygen out? Yes, I recently answered this question on the Facebook page last week. You're correct. Jojoba is a viable alternative as best as I can determine because it does have an extensive shelf-life--much longer than the eggs will. And yes, it is not a petroleum product. It's also a natural fungicide. As a liquid wax, it's actually ideal for this type of application for those who don't want a petroleum product and it's better than waterglass because it serves multi-purposes. I haven't seen anyone mention castor oil for eggs. Is this a viable alternative? After doing some research on castor oil it sounds like it should work well. And yes, it is considerably more expensive than mineral oil. BTW - love the site!!! You won't like the smell after it oxidizes AT ALL. So, sorry to make you repeat yourself, but I've read through all these comments and was hoping to get a complete concise response. If I'm concerned about petroleum based products because of the adverse estrogen effects, what are the other proven alternatives? Please and Thank You!!! "If you don’t like the idea of using mineral oil on your eggs, then do an internet search for a product called “Ke-Peg”. It’s water glass, and a natural way to preserve your eggs with no chemicals. It runs about $25. Each container is enough to do 40 dozen eggs. Water glass is sodium silicate, the common name for sodium metasilicate. Water glass is also sometimes referred to as liquid glass. If you’re really adventurous, you could make your own water glass. Click here for those directions. I just enjoyed some beautiful asparagus lightly sauteed in olive oil with a seasoned poached egg over the top of it for lunch! Yum!!! My husband and I are wondering about the hard boiled eggs... Do you oil them before, or after you boil them? You oil them as soon as you bring them home. There are 4 articles in total on preserving eggs. If you'll use the search bar and put in "preserving eggs" you'll find some great articles. Hi Kellene again. I had a couple quick questions for u. I oiled up about 10 dozen eggs about 3 weeks ago. I just opened one dozen to use and noticed the eggs looked dry, like when I first bought them. When I put them away in my fridge, they were very shiny and oily. I seen some oil at the bottom of the egg sitting in the carton. Did I do something wrong or is the egg suppose to look dry? I went ahead and flipped the carton to the other side. If I do it sooner than a month, will this effect anything? Also, I know you said to warm the mineral oil. After each dozen I notice the oil gets cold and I warm it again. Is that what I should be doing or do I just finish all the eggs with room temp oil?? Thanks so much for everything! The eggs will look dry after a while. Flipping once a month is sufficient. i have been disabled and forced onto meds etc fro pain,i am only now starting to prepare most think im nuts,especialy trying to stockpile for so many inmy immediate and i law family on about40 bucks a month,but i have faith now i have you to,thank you so much you are quite literaly saving our lives! i have been working rather studying with anonymous and occupy earth movements and i can tell you that what you fear is coming,gods speed,god bless and please feel free to contact me,i would be honored! ever hear of using water glass? old time method for egg preservation. Yes, it's addressed in one of the 4 detailed articles about preserving eggs. Kellene - First of all, thank you for everything you have done to help us all be more prepared. I think it's amazing that you try to answer everyone's questions while doing a million other things as well. Secondly, I searched the comments and didn't see anything regarding heavy mineral oil vs. light mineral oil. Is one preferred over the other? Additionally, is there a particular brand of mineral oil you suggest or use? Any help is greatly appreciated. Thank you! I don't get that choice when I purchase my mineral oil. I would be concerned about using anything that's defined as "light" though. There is usually just one choice for mineral oil in the pharmacy section that I purchase from. No specific brand. It's pharmaceutical grade though. You don't want the additional stuff that comes in the baby oil such as the fragrances. Mineral oil only.